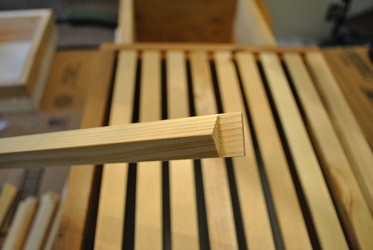 Last weekend was the cumulation of weeks and months of preparations to release bees. 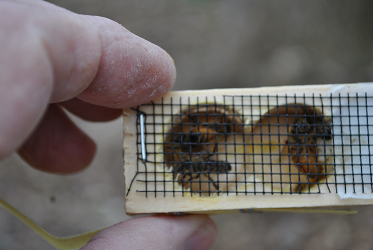 A little over 50 mason bees and approximately 40,000 honey bees. 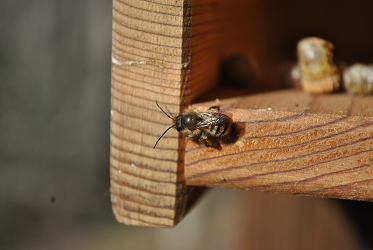 Last year I started my bee keeping endeavor with mason bees. 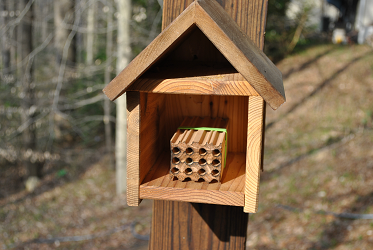 I placed a bee house with tubes for the mason bees to lay their eggs. The house gives them a nesting place for the females to lay eggs and larva to spin cocoons. Later the cocoons can be harvested for next year. I didn’t think I had any cocoons till I opened up the container to clean it for the bees I had ordered for this year and discovered over thirty cocoons. 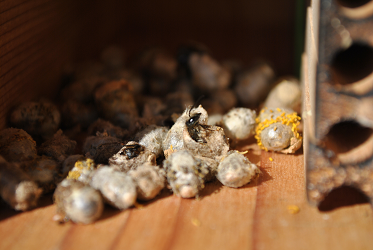 I placed them in the bee house and watched as four came out of the cocoons that they had wintered in. Previously they had been placed in a humdibee in the refrigerator to keep them content till the weather warmed up. 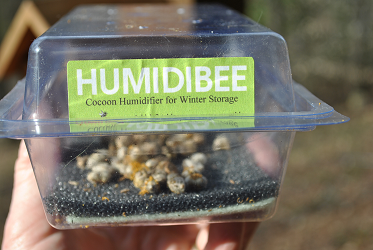 The humidibee keeps them cool and moist, if placed in the refrigerator and with water added occasionally. I placed some dirt in a container and added water to form mud for the bees to use to seal up the tube as they lay eggs. They should be all set to pollinate now. I also had one colony of honey bees last year that I kept in a Warre hive. I thought they were doing alright till I noticed the numbers decreasing. At the end of July, they had absconded. I decided I might do better with increased numbers. I decided to order extra hives and bees for this year. I picked up four packages of Italian honey bees that had just been brought up from Georgia. Each package has a queen in her own queen cage, a can of syrup for the bees to eat from and about three pounds of bees which is about nine to ten thousand bees. 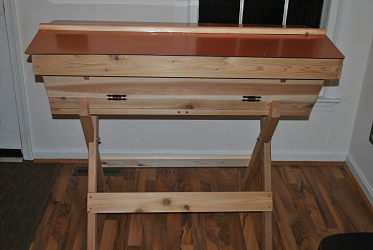 It helps to have everything in order and ready for the bees to be placed in the hive. I did wear a bee jacket and veil. First thing is to make sure the queen is active. The bee colony will not do well without a good strong queen. Once the queen was removed from the package, a hole is punched in one end of a piece of candy that is used to seal her escape. The cage is then placed in the bee hive and then all the rest of the bees are poured in, literally. The bees will see the hole in the candy and enlarge the hole so the queen can escape the cage. The queen is already bred so she is ready to start laying eggs, up to two thousand a day. The worker bees are now ready to start building comb so the queen will have a place to lay eggs. Forager bees have to find nectar and pollen to help sustain the colony and give the worker bees the food needed to build comb. 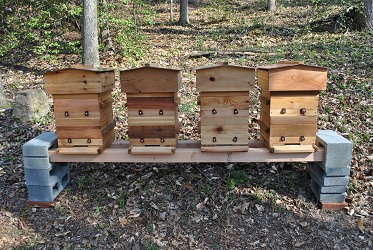 This process all started last fall with ordering the honey bees and mason bees. 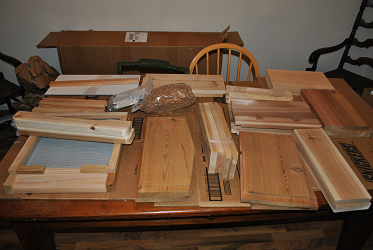 The hives wear also ordered last year but I didn’t get them assembled until this year. That put some pressure on me that was unneeded but my fault. 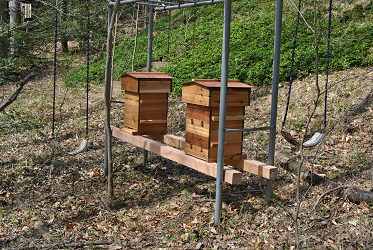 Everything worked out well and all the hives were assembled long before the bee pickup. I also had to get a bee permit from the City of Fredericksburg. 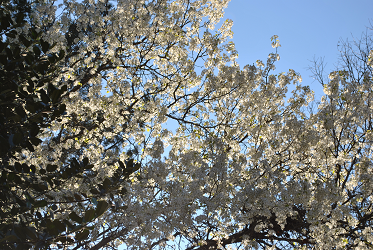 The ordinance allows two bee hives and colonies per lot, in the city. Fortunately, my neighbor has an interest in bees so there was a place to put the other two hives I have and packages that I had ordered. I decided that one of the best things I could do was to take a beekeeping class. The class starts in February and ended last week. I was really happy about taking the class, I met really nice people and learned a tremendous amount. Our instructor was very knowledgeable and experienced. I would highly recommend taking a course if you want to keep bees. That about sums up what led up to this last weekend bee release. Now to manage the bees so they are not in need of food or water and to be sure they stay healthy. This year will only have honey for the bees. Maybe next year if all goes well they will produce a little extra for me. 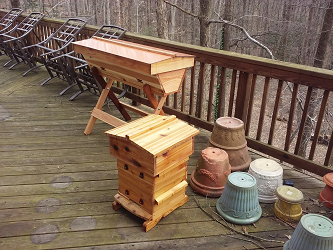 I assembled Warre hives and one regular top bar hive. Right now, I am using the Warre hives. 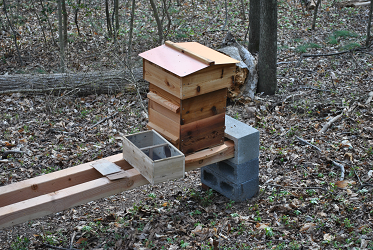 They take less maintenance than a Langstroth hive and a regular top bar hive (Kenya style). Make sure your queen that comes with the packages is alive, moving and healthy.